Background The methodological quality of studies on treatment of anterior cruciate ligament (ACL) injuries in skeletally immature children after ACL injury is low, and no prospective studies have evaluated the functional outcomes following a non-operative treatment algorithm. Purpose To report changes in knee function and activity level in skeletally immature children following a non-operative treatment algorithm for a minimum of 2 years after ACL injury. Methods 46 skeletally immature children aged 12 years and younger were evaluated at baseline and subsequent yearly follow-ups using patient-reported outcome measurements, isokinetic muscle strength measurements, single-legged hop tests and clinical examinations over a minimum period of 2 years. Participation in physical activities was monitored using a monthly online activity survey, and the main leisure-time sport activity was registered at the yearly follow-ups. Results 36 (78%) of the children did not undergo an ACL reconstruction during the follow-up. Statistically significant changes with questionable clinical relevance were discovered with the patient-reported outcome measurements or hop tests. Leg symmetry indexes were consistently above 90% for muscle strength and single legged hop tests throughout the study, and the isokinetic muscle strength improved significantly in the injured limb. Ninety-one per cent maintained participation in pivoting sports and/or physical education in school, although 38% of the ACL deficient children changed their main activity from a level 1 to a level 2 activity. Conclusions A non-operative treatment algorithm may be appropriate for ACL injured skeletally immature children, although a reduced participation in level 1 activities may be necessary for some children. An increased incidence of knee injuries in children has been reported over the last decade.1–4 However, low methodological quality of published studies on treatment of anterior cruciate ligament (ACL) injuries in skeletally immature children has been reported in a recent systematic review from our group.5 No randomised controlled trials and only two prospective studies were identified.6 ,7 Traditionally, skeletally immature children are recommended one of the following three treatment algorithms after ACL injury: a transphyseal surgical ACL reconstruction algorithm with the standard surgical procedure used for adults,8 ,9 a physeal sparing surgical ACL reconstruction with alternative placement of the graft tunnels to minimise the risk of physeal damage10 or a non-operative treatment algorithm with active rehabilitation in which an ACL reconstruction may be advised if persistent knee instability, unacceptable lowered activity level or secondary injuries occur.11 There is, however, no consensus with regard to treatment decision criteria in skeletally immature children after ACL injury. Functional performance tests, patient-reported outcome measurements and muscle strength measurements are standard and valid outcomes for adults with ACL injury.12–14 Thus, these outcomes are often utilised to determine whether the result of a treatment algorithm has been successful or not in adults with ACL injury.12 ,15–17 In contrast, previous studies on ACL injuries in skeletally immature children have traditionally evaluated knee function with measures such as passive laxity measurements, radiological assessments of possible growth disturbances and short-term return to sports rates. No studies have included functional performance tests to evaluate changes in knee function over time in this population.5 Additionally, return to preinjury sport activities is often used as a success criterion following an ACL injury.18 ,19 Other reasons unrelated to knee function may, however, be significant confounders influencing the rate of return to preinjury activities.20 Some individuals continue with their preinjury activities without a well-functioning knee, while others choose to lower their activity level even though their knee is functioning adequately.21 ,22 Thus, a more comprehensive assessment of knee function, including performance-based tests, registration of changes in activity level and clinical measures should also be used in studies on ACL injuries in children.17 ,19 The purposes of this prospective cohort study were twofold: (1) to report changes in knee function over time measured with performance-based functional outcomes and patient-reported outcome measurements in ACL injured skeletally immature children following a non-operative treatment algorithm and (2) to report changes in activity level in skeletally immature children following the treatment algorithm for a minimum of 2 years after ACL injury. Fifty-two skeletally immature children were identified as eligible, and 46 consecutive ACL injured children (47 knees), 12 years and younger, were recruited prospectively from the Department of Orthopaedic Surgery, Oslo University Hospital from March 2006 to October 2010. The inclusion criterion was a traumatic complete intrasubstance ACL injury sustained at the age of 12 years and younger. Individuals with either tibial or femoral ACL avulsion fractures were excluded. Six children were excluded; four because they had undergone ACL reconstruction without preoperative functional tests, and two had tibial avulsion injuries. A flow diagram of the study is provided in figure 1. All children followed a non-operative treatment algorithm previously published by our group.11 The algorithm advocates non-operative management until skeletal maturity is reached for children with open growth plates. No specific activity limitations were advocated, and all children were supplied with a custom-fit knee brace which they were encouraged to wear when participating in pivoting sports and physical education classes in school. An ACL reconstruction was considered if the structured rehabilitation programme did not lead to successful restoration of functional stability of the knee, if the child reported multiple giving way episodes, unacceptable reduced activity level or a symptomatic meniscal injury. Flow diagram of the eligible subjects. The diagnosis was confirmed through conventional diagnostic MRI,23 ,24 a positive Lachman test25 and an instrumented sagittal side-to-side knee laxity measurement difference of more than 3 mm (Manual maximum test, KT 1000, Med-Metric, San Diego, California, USA).26 Skeletal immaturity was confirmed from the diagnostic MRIs. The non-operative treatment algorithm involved a structured supervised rehabilitation through three rehabilitation phases.11 Progression to the next rehabilitation phase was allowed when specific functional milestones were reached. The children were permitted to return to their preferred activities when they passed a functional test battery at the end of rehabilitation phase three. A secondary prevention programme (phase four) consisting of neuromuscular and functional muscle strengthening exercises was encouraged when the children were released from physiotherapy. 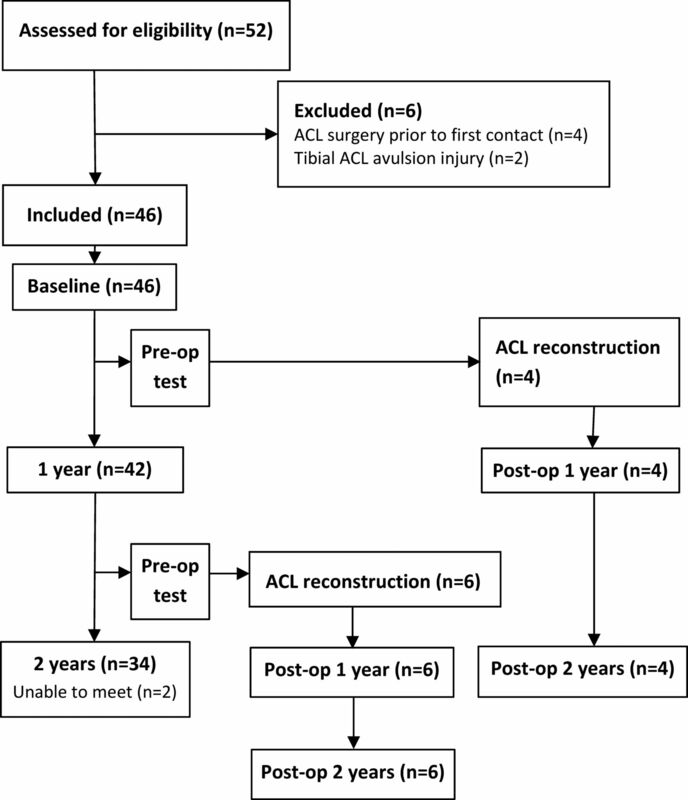 An identically structured supervised rehabilitation with three phases was administered after ACL reconstruction. The children underwent a baseline functional test battery as soon as they had completed phase two of the rehabilitation programme,11 and were able to perform single legged hops without pain. Ten consecutive quick hops on each leg were performed and clinically evaluated by the responsible physiotherapist. The children were asked whether it was painful and they responded with either yes or no. Children with a prolonged time from injury to diagnosis performed the baseline tests as soon as possible after the diagnosis was made. The same test battery was performed at subsequent follow-ups 1 and 2 years after baseline. Children who underwent an ACL reconstruction performed identical tests preoperatively, and at 1 and 2 years after the ACL reconstruction (figure 1). The tests were conducted and supervised by the same senior sport physiotherapist (HM), supplemented by specialists in sports physiotherapy from our sports medicine clinic. Prior to the functional tests, the children, together with their parents, completed three patient-reported outcome measurements: the Knee injury and Osteoarthritis Outcome Score (KOOS),27 the International Knee Documentation Committee Subjective Knee Form (IKDC 2000)28 and the Knee Outcome Survey Activities of Daily Living (KOS-ADLS).29 They also completed a visual analogue rating scale (VAS) of knee function from 0 (very poor knee function) to 100 (normal knee function). The children were asked to define their preinjury main leisure time sport activity, which was classified according to Hefti et al30 modified to European sport activities.19 ,31 At subsequent follow-ups, they defined their present main leisure time sport activity. Additionally, a monthly online activity survey (Questback AS, Oslo, Norway) was emailed to the families during the course of the study to monitor changes in participation, starting at baseline and ending at the 2-year follow-up. All performance-based functional tests were preceded by a standardised 10-min warm-up on a stationary bicycle. Thereafter, an isokinetic muscle strength test with five repetitions at a test velocity of 60°/s was performed using a Biodex 6000 dynamometer (Biodex Medical Systems Inc, Shirley, New York, USA). Four trial repetitions were performed prior to the five repetitions of maximal effort. The uninjured leg was tested first. Four single-legged hop tests (the single hop test, the triple crossover test, the triple hop test and the 6 m timed hop test) previously described by Noyes et al32 were included. All tests were performed without a knee brace. The rights of the subjects were protected by the Declaration of Helsinki. Predictive Analytics SoftWare Statistics (V.18.0.2 (2 April, 2010); SPSS Inc, Chicago, Illinois, USA) was used for all statistical analyses. Analysis of variance (ANOVA) (within-subjects model) with repeated measures and Bonferroni post hoc tests were used to test changes over time with a significance level of 0.05. If the assumption of sphericity was violated, the Greenhouse-Geiger correction was used to evaluate statistical significance. Moreover, if the assumption for the ANOVA with repeated measures was violated (data not normally distributed or ordinal), statistical differences were calculated using the Friedman test. A statistically significant result from the Friedman test was followed by a post hoc analysis using Wilcoxon Signed-Rank test. A Bonferroni correction, based on the number of repeated measurements, was applied using a significance level of p=0.017 for three measurements, and p=0.013 for four measurements. To adjust for increased height and weight between follow-ups, the peak torque values for isokinetic strength measurements were normalised to the child's body weight (Nm/kg×100). Leg symmetry indices (LSI) were calculated with methods reported in previous studies.31 Owing to the small number of children who underwent ACL reconstruction, we did not perform statistical analyses of differences from the preoperative test to the postoperative tests. The changes in scores from the preoperative test to the 2-year postoperative test were calculated as the score from the 2-year postoperative test minus the score from preoperative tests. Forty-six skeletally immature children with intrasubstance ACL injury, 16 (35%) girls and 30 (65%) boys, were included. The mean follow-up time was 3.2±1.1 years (mean±SD) from injury to the 2-year follow-up. Baseline characteristics of the children are shown in table 1. Twelve children performed the baseline tests more than 12 months after the initial injury due to prolonged time to diagnosis. The majority of injuries had occurred during alpine skiing and soccer (table 2). The diagnostic MRIs showed 28 (60%) knees with normal menisci, 6 (13%) knees with medial meniscal injury, 12 (25%) knees with lateral meniscal injury and 1 (2%) knee with medial and lateral meniscal injuries. No cartilage injuries were identified on MRI. All children had open tibial and femoral physes. Pivot shift test results at baseline were: grade 0: n=1 (2.1%); grade 1: n=8 (17.0%); grade 2, n=24 (51.1%) and grade 3: n=14 (29.8%). Throughout the follow-up, 36 children (37 knees) (78%) remained ACL deficient (figure 1). Four surgical procedures due to new symptomatic meniscal injuries were performed on these knees: three medial meniscal repairs and one medial meniscal debridement. Ten children (22%), eight girls and two boys, underwent an ACL reconstruction due to persistent instability (n=7), a symptomatic meniscal injury (n=2) or unacceptable reduced activity level (n=1). The 10 ACL reconstructions were performed using a transphyseal technique and a quadrupled hamstring tendon autograft, although one graft had to be converted to the iliotibial band because of harvesting failure during surgery. The mean age at the time of ACL reconstruction was 13.5±0.8 years, with a mean time from injury of 22.4±11.7 months. Concomitant surgical procedures were one medial meniscal repair, one lateral meniscal repair, one medial meniscectomy and one lateral meniscectomy. One medial femoral condyle cartilage lesion less than 2 cm2 (grade 3) was detected, although no cartilage repair technique was performed. Additionally, one child suffered an intraoperative injury to the tibial nerve during bicortical tibial drilling. Surgical procedures subsequent to the ACL reconstruction were performed in three knees: one medial meniscal repair after a new trauma, one resuture of a lateral meniscal repair and one debridement of a partial graft rupture. Four meniscus injuries were detected and treated (2 medial repairs and 2 lateral repairs) in the four excluded children. The median time from injury to surgery in these four children was 12.9 months (minimum 2.4 months, maximum 28.8 months). A total of 970 monthly online activity surveys were emailed to the families during the follow-up period, and 836 (86%) were returned. During the non-operative treatment period, starting from the baseline tests, 91% (n=760) reported monthly participation in pivoting sports and/or physical education classes in school. Eighty-five per cent (n=39) of all children reported a level 1 activity as their main preinjury activity, and 15% (n=7) reported a level 2 activity. The number of ACL-deficient children who reported a level 1 activity as their main activity was significantly reduced (p<0.01) from preinjury (39/46, 85%) to baseline (17/46, 37%), 1 year (22/42, 52%) and 2 years (17/34, 50%). Among the 10 children who underwent ACL reconstruction, 9 (90%) reported a level 1 activity as their preinjury activity. The main activity level reported by the ACL reconstructed children at the 2-year postoperative test were: level 1, n=4 (40%); level 2, n=1 (10%) and level 3, n=5 (50%). The KOOS subscale Activities of daily living changed statistically significantly in ACL deficient children with a mean improvement of 1.0 point from baseline to 1 year, while the subscale significantly declined 3.1 points from 1 to 2 years (figure 2). The isokinetic muscle strength for knee extension and knee flexion improved significantly throughout the study (p<0.01). The LSI of the single hop test improved by a mean 5.9 points (p=0.04) from baseline to 1 year, while the 6 m timed hop test declined by a mean 2.7 points (p=0.01) from 1 to 2 years (table 3). The five Knee injury and Osteoarthritis Outcome Score subscales for non-operated children at baseline, 1 year and 2 years postinjury (n=34). All children who underwent an ACL reconstruction grew taller (mean 6.6±4.9 cm, minimum 3 cm and maximum 19 cm) from the preoperative test to the postoperative test at 2 years. Results from the children who underwent ACL reconstruction are presented in table 4. Preoperatively, five children had a grade 2 pivot shift and five had a grade 3 pivot shift test. At 2 years postoperation, a grade 0 and grade 1 pivot shift was seen in four and six children, respectively. This is the first prospective cohort study to investigate changes in functional performance following a non-operative treatment algorithm of ACL injuries in skeletally immature children 12 years and younger. The main findings were that a majority (n=36, 78%) of the included children remained ACL deficient with adequate knee function, and that the number of new meniscal injuries was low (n=8, 17%) throughout the follow-up. Ninety-one per cent of the ACL deficient children reported consistent participation in pivoting sports and/or physical education classes in school. Still, 13 (38%) of the children who were ACL deficient at the 2-year follow-up did report abandoning pivoting sports (level 1 activity) as their main leisure time sport activity. Knee function measured with patient-reported outcome measurements and single-legged hop tests remained unchanged with regard to changes of clinical relevance, while the knee extension and flexion muscle strength significantly improved over the course of the study. The prospective design and the high compliance to follow-up assessments strengthen the findings of this study. No patients were lost to follow-up. Additionally, the number of participants was relatively high, and the included population with exclusively skeletally immature children was homogeneous. In total, this study therefore provides new knowledge on the growing challenge of ACL injuries in young children. There was a high adherence rate to the online activity survey, and 91% of the ACL injured children reported to be regularly participating in pivoting sports and/or physical education in school. However, from the reports of main leisure time sport activity, we found a significantly reduced rate of level 1 activities at all follow-ups. The present study was not designed to answer questions on why the children reduced their participation in level 1 sports. Fear of reinjury and other psychological factors have been shown to influence the rate of participation in pivoting sports after injury and reconstruction in adult ACL-injured individuals.20 ,22 Future studies should, thus, include reasons for why some children seem to change their leisure time activity patterns after ACL injury. Quadriceps muscle weakness has been associated with ACL injury, and has in many studies been shown to be difficult to recover if an adequately designed rehabilitation programme is not performed after the injury.40 Isokinetic quadriceps muscle strength LSI values of less than 90% has been described as abnormal,41 and believed to be related to impaired knee function and increased risk of reinjury in adults.42 The important knee stabilising contribution of the hamstring muscles has recently been highlighted by Zebis et al43 indicating that the restoration of knee flexion strength should be emphasised after ACL injury. Isokinetic muscle strength measurements using the peak torque value, with test velocities between 30 and 180°/s, have been documented to be reliable in healthy children,44 ,45 although the reliability and validity have not been investigated in a paediatric ACL injured population. In the present study, we found a statistically significant improvement in peak torque values normalised to body weight from baseline to 1–2 years in the ACL deficient children (p<0.01). Our study did not enable an evaluation on whether the observed increased muscle strength was beyond what is normally due to growth and maturation.45–47 However, the muscle strength in the non-injured leg also increased significantly from baseline and 1 to 2 years (p<0.01), which may suggest that the improvements in strength are related to maturation. Importantly, we found the mean LSI for both knee extension and knee flexion to be above 90% in all follow-ups for the non-operated children. Knee function measured with single-legged hop tests was found to be symmetrical with LSI values above 90% for all timepoints. Still, the results should be regarded with some caution as the reliability and validity of these tests have only been documented for ACL-injured adults.48 The rehabilitation programme implemented in the study was based on the principle that training for immature children should be safe, effective and enjoyable.11 ,49 Muscle strength gains in children are believed to be facilitated mainly through neural adaptive mechanisms and not hypertrophy.49 Thus, the rehabilitation was directed towards challenging neuromuscular knee stabilising strategies and plyometric exercises. The intention was to facilitate increased motor unit activation and changes in motor unit coordination, recruitment and firing. The observed improvements in muscle strength, and the symmetrical results of single-legged hop tests, indicate that the rehabilitation was adequate to facilitate adequate neuromuscular strategies in children. The rotational knee laxity was assessed clinically using the pivot shift test, and did not change for the non-operatively treated children over the course of the study (p=0.83). As expected, among the children who underwent surgical treatment, significantly fewer were classified with a positive pivot shift test after ACL reconstruction. A negative pivot shift test has been associated with a successful outcome after ACL reconstruction in adults,50 though a relationship between a positive test and functional instability in skeletally immature children with ACL injury has not been established. The non-operative treatment algorithm implemented in this study has been developed based on the conception that the results of surgical treatments are variable, and the risk of growth disturbances in skeletally immature children is significant. Additionally, a previous study from our group showed encouraging results after non-operative treatment with a low incidence (18%) of secondary meniscus injuries in a comparable population.34 The incidence of meniscus injuries in the present study was also low compared to reports from previous studies. Streich et al35 found that 50% of 12 non-operatively treated children suffered secondary meniscus injuries within a median time of 21 months. Two recent retrospective studies by Lawrence et al51 and Dumont et al52 have reported a significant increase in meniscus injuries with time from injury to ACL reconstruction in children. These differences may be related to the lack of arthroscopic assessments in the present study, or well-functioning non-operated children may be missed in retrospective studies on surgical treatment. Surgical treatments were considered only when subjective complaints of pain were presented, which leaves the possibility of undetected asymptomatic meniscus injuries being present in the non-operated knees. There are, however, several other concerns with performing ACL reconstructions in skeletally immature children. Bollen et al53 have highlighted the uncertain development of the graft when a soft tissue graft is implanted in the maturing knee, and Park et al54 have suggested that the youngest patients are likely to have a graft with a smaller diameter than mature patients. Hence, there may be a risk that a small graft in an immature knee may have lower strength when the child matures. Furthermore, Kim et al55 demonstrated that the angles between the ACL and tibia are changing in all three planes during growth. These changes, as well as the narrow anatomy in the skeletally immature knee, increases the technical difficulty with regard to obtaining an anatomical placement of the graft in the youngest patients.55 The technical challenges and the uncertain development of the graft further accentuate the importance of a thorough assessment before a skeletally immature child is recommended an ACL reconstruction. There are some limitations to this study. The variation in time from injury to baseline tests in the study was considerable. This is mainly because a number of the children were not correctly diagnosed despite seeking medical attention after the index injury and subsequent giving way episodes. Further, the included children were living in all parts of our country, and although the local physiotherapists were thoroughly informed of the treatment algorithm, we have not registered the compliance with rehabilitation. Seventy-eight per cent of the children continued non-operative treatment throughout the 2 year follow-up. The performance-based functional tests showed symmetrical knee function, and the number of surgical procedures for new meniscal injuries was low (n=6, 13%). Ninety-one per cent of them maintained participation in pivoting sports and/or physical education in school throughout the follow-up period, although a significant number of individuals changed their main activity from a level 1 to a level 2 activity. The results suggest that ACL deficient skeletally immature children continued to be physically active, but changed their type of sport participation. A non-operative treatment algorithm may be an adequate treatment option with regard to maintaining participation in physical activity with adequate knee function for skeletally immature children following ACL injury. This is the first study to prospectively investigate the functional outcomes of a non-operative treatment algorithm in skeletally immature children after anterior cruciate ligament (ACL) injury. ACL injured skeletally immature children may remain physically active following a non-operative treatment algorithm. A majority of ACL injured skeletally immature children report continuing a level 1 activity as their main leisure time sport activity following a non-operative treatment algorithm. Consultants and clinicians should more confidently be able to recommend a non-operative treatment algorithm to skeletally immature children with an ACL injury and their families. The authors thank Kristin Bølstad, Marianne Bakke Johnsen, Marte Lund and Carina Wold for their contribution with the data collection. Additionally, The Norwegian Sports Medicine Clinic (NIMI) is acknowledged for the contribution of infrastructure.
. Youth sports anterior cruciate ligament and knee injury epidemiology: who is getting injured? In what sports? When? Clin Sports Med 2011;30:691–706.
. The risk for a cruciate ligament injury of the knee in adolescents and young adults: a population-based cohort study of 46 500 people with a 9 year follow-up. Br J Sports Med 2008;42:422–6.
. The current evidence for treatment of ACL injuries in children is low: a systematic review. J Bone Joint Surg Am 2012;94:1112–19.
. Anterior cruciate ligament injuries in skeletally immature patients. J Pediatr Orthop 1996;16:673–7.
. Transphyseal reconstruction of the anterior cruciate ligament in prepubescent children. J Bone Joint Surg Br 2008;90:1317–22.
. Transphyseal anterior cruciate ligament reconstruction in skeletally immature pubescent adolescents. J Bone Joint Surg Am 2007;89:2632–9.
. Transphyseal anterior cruciate ligament reconstruction in the skeletally immature: follow-up to a minimum of sixteen years of age. J Bone Joint Surg Am 2013;95:e11–16.
. Physeal sparing reconstruction of the anterior cruciate ligament in skeletally immature prepubescent children and adolescents. J Bone Joint Surg Am 2005;87:2371–9.
. Management of anterior cruciate ligament injuries in skeletally immature individuals. J Orthop Sports Phys Ther 2012;42:172–83.
. Functional tests should be accentuated more in the decision for ACL reconstruction. Knee Surg Sports Traumatol Arthrosc 2010;18:1517–25.
. Knee pain and mobility impairments: meniscal and articular cartilage lesions. J Orthop Sports Phys Ther 2010;40:A1–35.
. A decision-making scheme for returning patients to high-level activity with nonoperative treatment after anterior cruciate ligament rupture. Knee Surg Sports Traumatol Arthrosc 2000;8:76–82.
. Return-to-sport outcomes at 2 to 7 years after anterior cruciate ligament reconstruction surgery. Am J Sports Med 2012; 40:41–8.
. Return to the preinjury level of competitive sport after anterior cruciate ligament reconstruction surgery: two-thirds of patients have not returned by 12 months after surgery. Am J Sports Med 2011; 39:538–43.
. A pair-matched comparison of return to pivoting sports at 1 year in anterior cruciate ligament-injured patients after a nonoperative versus an operative treatment course. Am J Sports Med 2012;40:2509–16.
. Self-efficacy, symptoms and physical activity in patients with an anterior cruciate ligament injury: a prospective study. Scand J Med Sci Sports 2007;17:238–45.
. Accuracy of MR imaging of the knee in adolescents. AJR Am J Roentgenol 2003;180:17–19.
. Anterior cruciate ligament tears: MR imaging-based diagnosis in a pediatric population. Radiology 1999;213:697–704.
. Diagnostic performance of clinical examination and selective magnetic resonance imaging in the evaluation of intraarticular knee disorders in children and adolescents. Am J Sports Med 2001;29:292–6.
. Instrumented measurement of anterior knee laxity in patients with acute anterior cruciate ligament disruption. Am J Sports Med 1985;13:401–7.
. Knee Injury and Osteoarthritis Outcome Score (KOOS)–development of a self-administered outcome measure. J Orthop Sports Phys Ther 1998;28:88–96.
. Evaluation of knee ligament injuries with the IKDC form. Knee Surg Sports Traumatol Arthrosc 1993;1:226–34.
. Individuals with an anterior cruciate ligament-deficient knee classified as noncopers may be candidates for nonsurgical rehabilitation. J Orthop Sports Phys Ther 2008;38:586–95.
. The International knee documentation committee subjective knee evaluation form: normative data. Am J Sports Med 2006;34:128–35.
. Performance-based functional outcome for children 12 years or younger following anterior cruciate ligament injury: a two to nine-year follow-up study. Knee Surg Sports Traumatol Arthrosc 2008;16:214–23.
. Transphyseal reconstruction of the anterior cruciate ligament in prepubescent athletes. Knee Surg Sports Traumatol Arthrosc 2010;18:1481–6.
. Reliability, Validity, and Responsiveness of a Modified International Knee Documentation Committee Subjective Knee Form (Pedi-IKDC) in Children With Knee Disorders. Am J Sports Med 2011;39:933–9.
. Development of the Knee Injury and Osteoarthritis Outcome Score for Children (KOOS-Child). Acta Orthop 2012;83:666–73.
. Transphyseal anterior cruciate ligament reconstruction in patients with open physes. Arthroscopy 2009;25:831–8.
. Measures of knee function: International Knee Documentation Committee (IKDC) Subjective Knee Evaluation Form, Knee Injury and Osteoarthritis Outcome Score (KOOS), Knee Injury and Osteoarthritis Outcome Score Physical Function Short Form (KOOS-PS), Knee Outcome Survey Activities of Daily Living Scale (KOS-ADL), Lysholm Knee Scoring Scale, Oxford Knee Score (OKS), Western Ontario and McMaster Universities Osteoarthritis Index (WOMAC), Activity Rating Scale (ARS), and Tegner Activity Score (TAS). 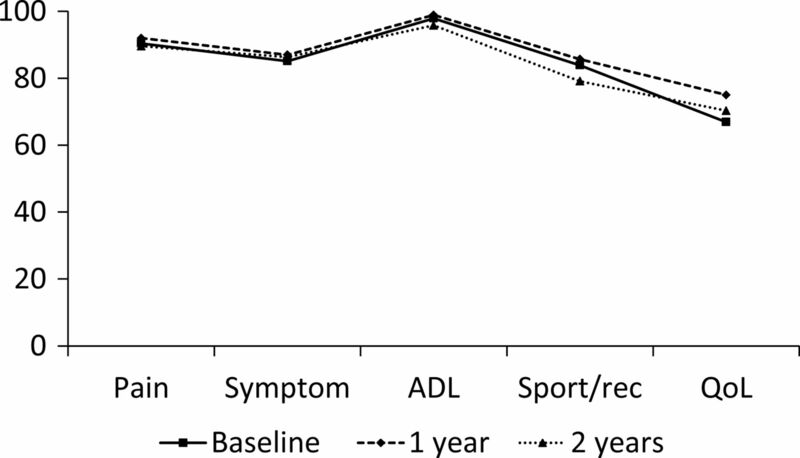 Arthritis Care Res (Hoboken) 2011;63(Suppl 11):S208–28.
. A progressive 5-week exercise therapy program leads to significant improvement in knee function early after anterior cruciate ligament injury. J Orthop Sports Phys Ther 2010;40:705–21.
. Rehabilitation following anterior cruciate ligament injury: current recommendations for sports participation. Sports Med 2004; 34:269–80.
. The relationship between knee strength and functional stability before and after anterior cruciate ligament reconstruction. J Orthop Res 2003;21:231–7.
. Acute fatigue impairs neuromuscular activity of anterior cruciate ligament-agonist muscles in female team handball players. Scand J Med Sci Sports 2011;21:833–40.
. Reliability of dynamic strength knee muscle testing in children. J Orthop Sports Phys Ther 1995;22:73–6.
. Assessment and interpretation of isokinetic muscle strength during growth and maturation. Sports Med 2003;33:727–43.
. Resistance training in musculoskeletal rehabilitation: a systematic review. Br J Sports Med 2012;46:719–26.
. Longitudinal changes in isokinetic leg strength in 10–14-year-olds. Ann Hum Biol 2002; 29:50–62.
. Hop testing provides a reliable and valid outcome measure during rehabilitation after anterior cruciate ligament reconstruction. Phys Ther 2007;87:337–49.
. Implications of the pivot shift in the ACL-deficient knee. Clin Orthop Relat Res 2005;436:229–36.
. Degeneration of the knee joint in skeletally immature patients with a diagnosis of an anterior cruciate ligament tear: is there harm in delay of treatment? Am J Sports Med 2011;39:2582–7.
. Meniscal and chondral injuries associated with pediatric anterior cruciate ligament tears: relationship of treatment time and patient-specific factors. Am J Sports Med 2012;40:2128–33.
. Changes in the four-strand hamstring graft in anterior cruciate ligament reconstruction in the skeletally-immature knee. J Bone Joint Surg Br 2008;90:455–9.
. Anterior and posterior cruciate ligaments at different patient ages: MR imaging findings. Radiology 2008;247:826–35. Contributors All authors contributed to the data collection, reporting of the work and final approval. HM, LE and MAR contributed to the development and design of the project. HM was also responsible for coordination of the data collection, data analysis and for the overall content as a guarantor. Ethics approval The South-Eastern Norway Regional Committee for Research Ethics. Data sharing statement All unpublished data with the detailed results of each individual child are available upon request. However, we are planning a long-term follow-up study in which all data will be incorporated.